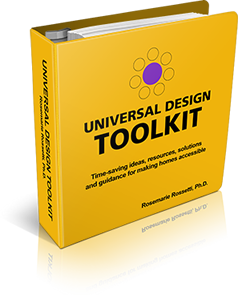 Universal design and “green” building design are totally compatible approaches in home construction. 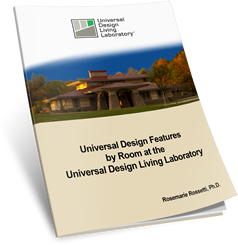 The home that I am building, the Universal Design Living Laboratory, (www.UDLL.com) in metropolitan Columbus, Ohio, will serve as a national model showcasing how this marriage can take place. “Green” is an approach to building homes that conserves natural resources and highlights environmental quality. These homes are healthier in terms of air and water quality. The products used to build these homes emit fewer health endangering gases or volatile organic compounds (VOC). These gases are often produced from paints, stains, carpeting, wall paper, flooring adhesives, plywood, solvents, and synthetic fabrics. A house is “green” if it is built and furnished with recycled or renewable resources. For example, hardwood floors are easier to roll on than carpeting for a wheelchair-user. In a universal design home, there are “green” options to hardwood flooring. Bamboo is one alternative. It is not really a wood, but rather a fast-growing grass with a seven-year growth cycle and is harder than maple or oak. Eucalyptus is another hard and durable wood grown in sustainable forests. It is harder than cherry or pine. If carpeting is preferred in a universal design home, then select one that is easy to roll on in a wheelchair. Choose a carpet with a thin pad installed underneath. One “green” recycled-fiber carpet choice is made of polyester fiber recovered from plastic soda bottles. This plastic is often called PET, short for polyethylene terephthalate. Wool carpets are also considered “green.” They tend to be pricey, but they last a long time and are stain resistant. “Green” homes use less energy and some incorporate alternative energy systems like geothermal, photovoltaic cells, and windmills. These homes also take advantage of the construction site and place many windows on the south side of the home to better utilize the heat of the winter sun, which saves on heating costs. Landscape design includes the installation of shade trees to help the home. Large overhangs on the south-facing side of the house help shade the windows in summer. Energy consumption is further reduced by wall and ceiling insulation improvements. A guide for insulation is a thermal resistance (R) rating of R-13 for walls, ceiling, and roof in the southern states and R-19 for walls and R-38 for ceilings and roofs in the northern states. Some insulation products that are “green” include: recycled cotton, recycled newsprint (cellulose), soy-based foam, or wool. Another way to save on heating and cooling bills is to install multiple pane windows having argon gas-filled Low E II insulating glass. The argon gas-filled space between the panes of glass offers insulation against the transfer of heat. A coating on the glass significantly blocks the sun’s ultraviolet rays. When choosing appliances, lighting, heating and cooling systems, select those that will save money. ENERGY STAR (www.energystar.gov) rated products use less water and energy. Wherever possible, use the sun to light your home. Sunlight can provide the task lighting you need for many hours in a day, saving you the need to turn on an electric light. Integrate as much natural light as possible by installing windows, skylights, sun tunnels, glass block, and dormers. When selecting lighting for night time and cloudy days, include LED and compact fluorescent light bulbs to save electricity. Home buyers and remodelers concerned about living in healthier homes, and saving money through lower water, electricity, and gas bills are often concerned about the initial cost of green products. These products are more prevalent than in the past and are highlighted in manufacturers’ marketing materials. Price points for green products do not always have a higher price tag associated with them. In view of the health benefits, energy savings, and stewardship of the earth, building green is a better way to build.